Ace BBC journalist John Humphrys broadcast classic myths about the European Union’s budget on Radio Four’s ‘Today’ programme yesterday. If he can get it wrong, is it any wonder that the British public is so confused? 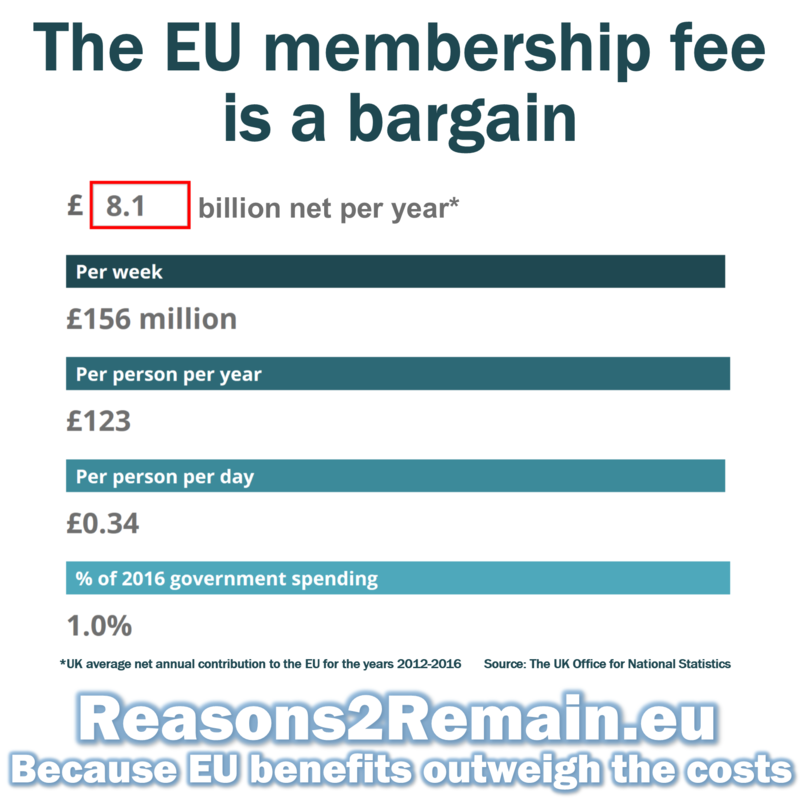 At 8:35am on Friday 7 November, John interviewed European Commission spokesman, Jakub Adamowicz, about the EU’s demand for an extra £1.7b from the UK. His statements were completely inaccurate. The European Commission’s books are balanced. Independent auditors have passed and signed off the Commission’s accounts as accurate and have done so for every year of the recently ended EU accounting period of 2007-2013. I have made a complaint to the BBC about this serious inaccuracy and hope that John will issue a correction. He is usually a stickler for accurate reporting and I feel sure that he will want to set the record straight. • The EU budget is always balanced, so there is no debt or deficit. • The independent European Court of Auditors signed off the European Commission accounts every year for the entire 2007-2013 accounting period. • The Auditors reported that the European Commission’s accounts were legal, regular and reliable (i.e. accurate). • The Auditors found that EU revenue was free of ‘material error’. • The Auditors criticised the error rate of 4.7% of the 2013 Commission’s expenditure. But this ‘error rate’ is specifically not fraud. It relates to expenditure not strictly applied according to EU regulations. Most errors took place at national level by EU member states rather than in Brussels. The goal of the EU is to have an error rate of no more than 2%. • The EU states that it “claws back” undue payments from the projects or countries at fault. This can bring the average error rate to below 2%. 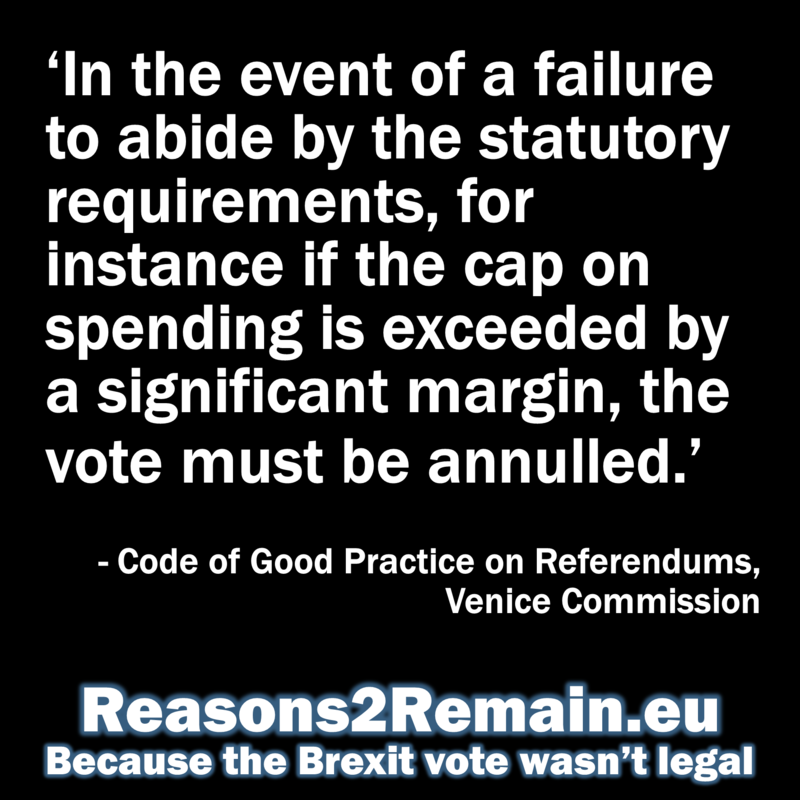 • Over 95% of all EU expenditure is in line with the rules. • 94% of the EU budget is actually spent in EU countries on policies and programmes that benefit citizens directly. By comparison, fraud and error costs the UK Government more than £30bn every year. Fraud alone amounts to £20bn. Nearly £10bn goes missing as a result of administrative errors. Fraud and error losses in the UK are equivalent to more than five per cent of government receipts. This is worse than the EU accounts. • UPDATE: Clarifications just received from the independent European Court of Auditors. The Auditors confirm that they signed off EU 2013 accounts as reliable. Less than 5% of EU budget affected by error. Full Fact: Has the EU Budget been rejected by auditors for the past 18 years? • Receipt from the BBC regarding my complaint about the inaccurate broadcast on the Radio 4 Today programme. 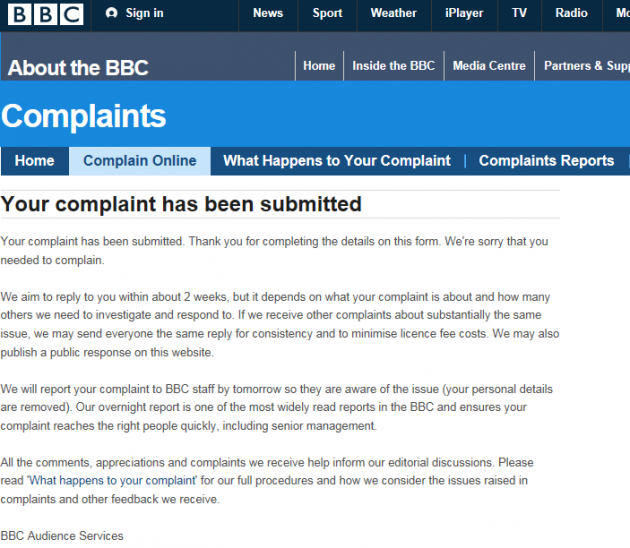 If you also wish to complain, please click the graphic to go to BBC Complaints section. Daily Mail: Trick or truth? This entry was posted in Current Affairs, Democracy & Citizenship, Economics & Trade, Law & Justice, Media & Communications, Politics & Public Policy, Society & Culture, The EU and tagged BBC, Clacton, EU, EU auditors, EU budget, EU myths, European Commission, European Court of Auditors, European Union, Jakub Adamowicz, John Humphrys, Jon Danzig, Radio 4, UKIP. Bookmark the permalink. Previous: Why did UKIP win in Clacton? Thank you Paul for posting the link from FullFact, I will also add it now to the main story. I always love your courageous stance and political debates and I’m a great fan but this criticism of JH is wide of the mark. I thought Humphreys was quite gentle on the commissioner in the context of the week’s news. Humphreys was just picking up on the story carried by all the papers, thus reflecting the hot topic of the days before. That’s the structure of the Today programme. They aren’t his views. He plays devil’s advocate. That’s his role. Moreover, the interview was conducted in Humphrys’ usual style where he encourages his guest (Adamowicz in this case) to respond and he gives him ample time to do so. Humphreys did say: ‘Correct me if I’m wrong”. Adamowicz is a lightweight and if this is all the EU can put up as a voice then this is only going to get worse. The European Court of Auditors reported on Tuesday that controls over 86 per cent of the EU budget last year were only “partially effective”, a conclusion that has further polarised the battle over European Commission demands for a sharp rise in spending. Vitor Caldeira, the ECA’s chairman, said that auditors had “found too many cases of EU money not hitting the target or being used sub-optimally” at a time when national public spending was being cut and the eurozone was imposing austerity targets. Despite 18 years of critical reports by the auditors, the Commission and European Parliament have defied calls for austerity measures at the EU level by demanding an 11 per cent increase to long-term Brussels expenditure from 2014 to 2020. Ever since it started producing annual reports into European finances in 1994, the Court of Auditors has failed to sign off the EU’s accounts because of widespread irregularities, including fraud. Last year, the auditors’ annual report prompted the Government to warn that the findings “seriously undermines the credibility of the EU’s financial management” after the audit found that £89 billion of European spending was “affected by material error”. Mr Van Rompuy acknowledged that the auditors must make “results known” but insisted that they had “another responsibility: that of being as didactic as we possibly can” in order to help instruct the public about the benefits of EU membership. It’s valid for Humphreys to pursue his questioning, and in the manner he did, within this context. That’s his job: NOT to have a view but to probe. Thanks for your comments, Greg. I do believe, however, that on this occasion, John Humphrys was asserting facts that he believed to be true, rather than his usual robust style of questioning or playing ‘devil’s advocate’. I agree that the responses given by the European Commission spokesperson invited to the programme, Jakub Adamowicz, were inadequate and at times he didn’t seem to understand the questions. However, many listeners will have believed from John’s forthright statements that it was true what he said: that the official auditors had never signed off the EU accounts. This was completely incorrect, and John’s statements were a further gift to UKIP to promote Britain’s withdrawal from the EU. 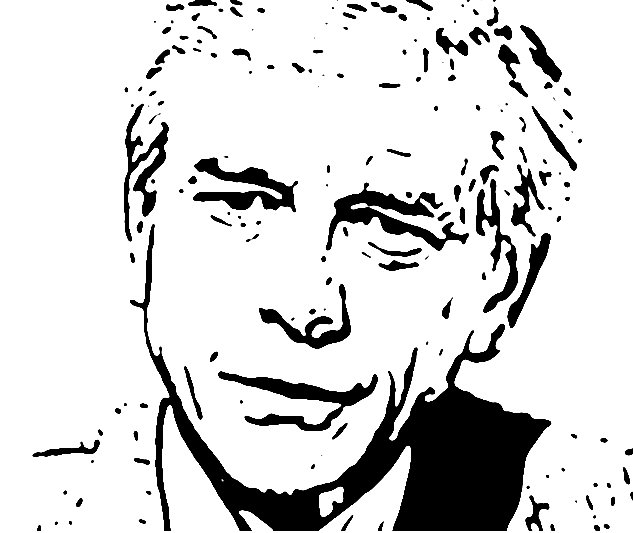 I also agree with you that John Humphrys used the phrase, “correct me if I’m wrong?”, but on other occasions in the interview, he did not present his statements as a question, but instead it sounded as if these were straightforward facts being put forward by an eminent, respected and well-informed commentator. It is therefore my view that his usual standard of journalism slipped. For the sake of accurate journalism and balanced reporting, the BBC should have corrected John Humphrys inaccurate assertions without delay. 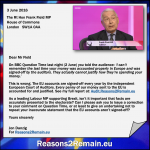 I feel I was right to use my blog to do that, because without John Humphrys commentary being corrected, many will believe the old, completely untrue myth that the EU accounts have not been passed by the auditors or that they are somehow faulty or inaccurate. I am still hopeful that the BBC will set the record straight on this important issue. If Britain has a referendum on whether to stay a member of the European Union, it’s vital that citizens are provided with accurate information. Incidentally, I cannot find in the Auditor’s report any reference that “£89 billion of European spending was affected by material error.” Furthermore, you have in your posting repeated the inaccuracy that, “Ever since it started producing annual reports into European finances in 1994, the Court of Auditors has failed to sign off the EU’s accounts because of widespread irregularities, including fraud.” Greg, this simply is not true, and yet another example of grossly inaccurate reporting by the British media about the European Union. This is not good for democracy. The European Union accounts were signed off by the Auditors, who gave the accounts a ‘clean bill of health’ and found them to be legal, reliable and accurate. This is a matter of record. Fraud is only estimated to be 0.2% which by international standards is exceptionally low (and better than the UK government accounts). In addition, the Auditors found an error rate (error, not fraud) of 4.7%, when the goal is less than 2%. But an “error rate” is found in the accounts of all governments, including the UK’s. In the USA, for example, they often have an error rate (or “improper payments” as they call it) of over 5%, much worse than that of the EU, but that doesn’t mean the USA accounts are not signed off. Please give me details of any government accounts anywhere in the world that does not have some element of error in their accounts. This is all a red herring, simply to cast aspersions against the EU. The EU accounts are balanced, fair, accurate and legal. The ‘error rate’ of 4.7% is too high, but certainly not the world’s worst (some UK government departments are considerably worse). The EU is making strenuous efforts to reduce the error rate to its target of 2% or less. The opening remark by John Humphrys – that the EU has not balanced its books – shows one of the reasons why this myth perpetuates: journalists assume the EU budget works like the budget of a national member state, which it doesn’t. Unlike national accounts, the EU budget cannot generate debt or be in deficit. It is balanced, each and every year. The annual report by the Court of Auditors is the necessary independent scrutiny on what is public money. It is a check against strict, complex and detailed rules – a lot of them procedural, not financial – and with a high bar for compliance. The Commission takes very seriously the advice of the Court and has introduced various reforms and improvements which have led to a significant reduction in the error rate – for example, by half for Regional policy spending (responsible for millions of projects each year managed locally by member states). Often – and this is something the Court acknowledges – the errors are first detected by audits and checks carried out by the Commission. I can’t see how you can say this about Humphreys. It’s a long tested british style and he uses it effectively every day. It’s reasonable to present the prevailing consensus, right or wrong, for comment. And throwing it into the ring gives the guest context for a thrustful repost. Humphreys sets it up to be knocked down. It was lacking. Humphreys gives Ukip the worst time of all (thankfully) — and in much the same style. I will point out some examples in time. And again you mention the BBC should have made a correction. This topic was all over the media so why just the BBC? Humphreys was way at the end of the queue. You will be waiting for a hundred retractions! This is just BBC bashing with no justification. And again, you seem to be mixing views put on the table for debate with personal views. This is not good journalism Jon. Repeating what is out there isn’t agreeing! 1. You never mentioned that Humphreys’ comments were presented in a context following a long day of media comment. Moreover, you are doing the same with my comments. I am responding to your process and analysis of the discussion not the EU budget issues!! 2. On the comment on your blog you didn’t feature Adamowicz’s replies. 3. You never mentioned that Adamowicz’s had ample time from the BBC to respond. 4. Did Caldeira say auditors had “found too many cases of EU money not hitting the target or being used sub-optimally”? It seems he did. The EU needs to up its game to get the points over. After the media barrage, and in the present climate, if Adamowicz is all they can come up with one would assume they simply can’t be bothered. It’s not the BBC that needs to sort itself, it’s the voice of the EU. European Commission Representation in the UK: Whoever you are: I think you would have been better going on air to respond to Jon Humphreys. These points put forcibly would have helped. It is what Humphreys would have wanted and expected. Add your name and up your game! In my latest article I report more fully about the exchange between Humprhys and the EU spokesman, Jakub Adamowicz, and no, I don’t think John Humphrys let him get much of a word in edgeways. It seemed Humphrys was convinced by the misinformation that the EU accounts had never been balanced or passed by the auditors, and he simply didn’t believe the denials by Adamowicz. In my view (yes, this is a place for my views!) I don’t think this represented balanced news-reporting or Humphrys finest moment on air. I agree with the Auditors criticism of the EU accounts, but my role was simply to put that criticism into context. The administrative errors in the 2013 EU budget were not good enough, but they represented 4.7% of the overall budget, and not the entire budget. 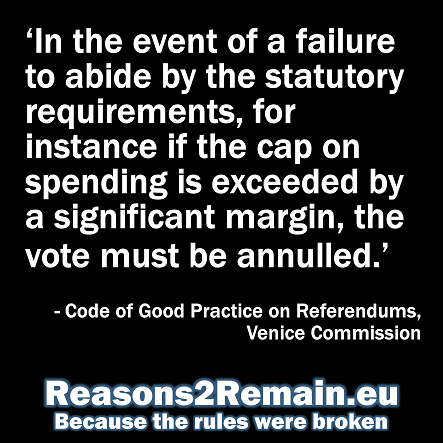 Over 95% of the EU budget was spent according to the rules. And most of the errors with the budget occurred away from Brussels and by member states at national government level – including the UK government – who actually control 80% of the EU funds and should have worked harder to prevent the errors in the first place. Why are the media only blaming the European Commission when it’s our own government – along with the other member states – that should be shouldering a large part of the blame? The way the UK media report the EU it’s as if it’s a foreign organisation that somehow has control over us. But we are the EU. We are part of it; we are members, we help to create and shape what it is. If something is wrong, not only is it our fault, it is also incumbent upon us to help to ensure that it does better in future. Yes, I see you’ve developed the point to encompass British Media. I think that’s fine. It was just that your initial hit was aimed at the Today programme which had simply gathered up the previous day’s coverage. Humphrey’s gave him lots of time — by any standards. Adamowicz went off at a strange tangent. It sounds as if you’re not a regular listener! You miss my point about personal views. I was simply saying I haven’t said what my views are and neither has Humphreys. But your implication is that we both have! Of course you can air your views. Keep doing so! Thanks Greg. I am actually a long-term fan of the Today programme and have been listening to it almost every day since I was 15. 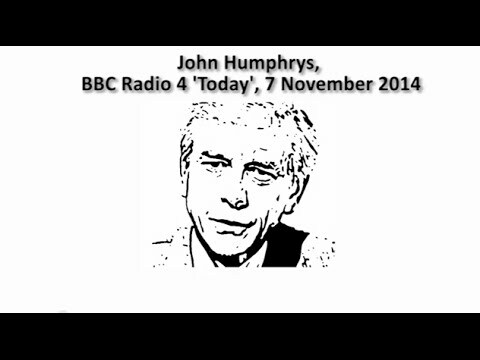 I regard John Humphrys as one its best presenters, along with Brian Redhead, Sue McGregor and John Timpson. I have also worked with John Humphrys when he presented one of my video programmes – ditto Brian Redhead. So none of this is personal; I have the highest regard for ‘Today’. However, I specifically targeted the Today programme in my first blog about this because I felt the broadcast didn’t adopt the programme’s usual standard of reporting, or John Humphrys usual balanced style of interviewing. Have you listened back to the interview between John Humphrys and Mr Jakub Adamowicz? I have several times and of course I had to transcribe it word-for- word for my blogs, so I know the interview well. 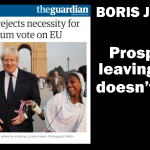 In that interview, Mr Adamowicz gave the correct answers – albeit not as forcefully or lucidly as I’d hoped – but John Humphrys cut over him and kept repeating, almost like a mantra, that the European Union Budget had never been signed off or balanced. If John was playing ‘devil’s advocate’ – which I agree can sometimes be a useful interviewing technique – I would have expected him to knowingly present the “wrong information” about the EU accounts, but then to have given Mr Adamowicz the opportunity to properly and fully reply. That, in my view, is not what happened. I feel strongly about this because if we’re not careful, we will leave the EU not necessarily because it’s a bad thing, but because we’re constantly being given the wrong information by a powerful, Eurosceptic press. I have no idea what John Humphrys view on the European Union is, but I suspect he simply picked up inaccurate information about the EU budget from the daily newspapers delivered to his desk. However, the correct information was easy to find and verify if one looked and checked. Good journalism entails ensuring that listeners, viewers and readers are presented with accurate facts. Mr Adamowicz tried to provide those facts, but John Humphrys spoke over him. How independent is the ECA? It is one of the institutions of the European Union? And where does it get its funding from? The European Court of Auditors is indeed an EU institution. It has been established by the Treaty (of Brussels in 1975) to carry out the audit of EU finances, as the EU’s external auditor. In this role, we contribute to improving EU financial management, promote accountability and transparency and act as the independent guardian of the financial interests of all citizens of the Union. We are a professional organisation and follow the same international auditing standards applied by public auditors worldwide. We audit impartially, while taking into account the views of stakeholders, such as the European Parliament, Council of the EU, and the general public, but – as the Treaty (TFEU, article 286) states – “we shall neither seek nor take instructions from any government or from any other body”, nor are we succumbing to pressure from any outside source. The ECA is financed by the general budget of the European Union. Our financing accounts for around 0.1 % of total EU spending (for detailed figures, please see our Annual Activity Report 2013) and our output continues to grow. Our largest single product is our annual report (the most recent having been published on 5 November 2014), which gives a deep insight into the way the EU budget is spent by the European Commission and the EU`s 28 Member States, including examples of errors and assessments of control systems. We also publish special reports. These set out the results of our performance audits, evaluating effectiveness of EU spending and its value for money, on topics ranging from urban transport to banking supervision to emergency support to Haiti. In addition, we are developing new products, such as ‘landscape reviews’ of different areas which are very important, but are normally not susceptible to audit. We recently published one on accountability and public audit gaps in the EU”, and we have one coming out next week on risks to EU financial management. We encourage everyone to take a look at our output, available on our website (eca.europa.eu), and become better informed about our work and its impact.